Leland brings to the design table miniaturized gas filled cartridges with an indefinite storage life. 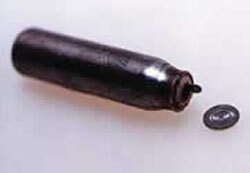 These cartridges, as small as 1" long, can have stored pressures up to 3000 psi. They are quite efficiently made and millions are kept in stock at any given time. Many types of gases can be used. Regulators and control valves are typically available for most applications. 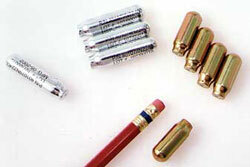 The cartridges are puncturable and when welded closed, provide an extremely reliable and unique way to store energy. Mini Cartridges are defined as a pressure vessel with an internal water capacity less than 9cc. Filling pressures may be achieved of up to 4,000 psi under certain circumstances. The table below shows most of the mini cartridges stocked at out South Plainfield facility. Mass production pricing is quoted directly based on many parameters. In most instances, samples can be procured for a nominal cost.